Battery recycling is a recycling activity that aims to reduce the number of batteries being disposed as municipal solid waste. Batteries contain a number of heavy metals and toxic chemicals and their dumping has raised concerns over soil contamination and water pollution. Most types of batteries can be recycled. However, some batteries are recycled more readily than others, such as lead-acid automotive batteries (nearly 90% are recycled) and button cells (because of the value and toxicity of their chemicals). Other types, such as alkaline and rechargeable, e.g., nickel–cadmium (Ni-Cd), nickel metal hydride (Ni-MH), lithium-ion (Li-ion) and nickel–zinc (Ni-Zn), can also be recycled. These batteries include but are not limited to: car batteries, golf cart batteries, UPS batteries, industrial fork-lift batteries, motorcycle batteries, and commercial batteries. These can be regular lead acid, sealed lead acid, gel type, or absorbent glass mat batteries. These are recycled by grinding them, neutralizing the acid, and separating the polymers from the lead. The recovered materials are used in a variety of applications, including new batteries. The lead in a lead-acid battery can be recycled. Elemental lead is toxic and should therefore be kept out of the waste stream. Lead-acid batteries collected by an auto parts retailer for recycling. Many cities offer battery recycling services for lead-acid batteries. In some jurisdictions, including U.S. states and Canadian provinces, a refundable deposit is paid on batteries. This encourages recycling of old batteries instead of abandonment or disposal with household waste. In the United States, about 99% of lead from used batteries is reclaimed. Li-Ion and also Li-Phosphate batteries often contain among other useful metals high-grade copper and aluminium in addition to rare earths. A complicating factor is the water sensitivity: Lithium Hexafluorophosphate, a possible electrolyte material will react with water to form hydrofluoric acid; cells are often immersed in a solvent to prevent this. Once removed the jelly rolls are separated and the materials removed by ultrasonic agitation leaving the electrodes ready for melting down and recycling. Pouch cells are particularly easy to recycle in this way and some people already do this to salvage the copper despite the safety issues. Several sizes of button and coin cell. They are all recyclable in both the UK and Ireland. In 2006 the EU passed the Battery Directive of which one of the aims is a higher rate of battery recycling. The EU directive states that at least 25% of all the EU’s used batteries must be collected by 2012, and rising to no less than 45% by 2016, of which, that at least 50% of them must be recycled. In early 2009 Guernsey took the initiative by setting up the Longue Hougue recycling facility, which, among other functions, offers a drop-off point for used batteries so they can be recycled off island. The resulting publicity meant that a lot of people complied with the request to dispose of batteries responsibly. From April 2005 to March 2008, the UK non-governmental body WRAP conducted trials of battery recycling methods around the UK. The methods tested were: Kerbside, retail drop-off, community drop-off, postal, and hospital and fire station trials. The kerbside trials collected the most battery mass and were the most well received and understood by the public. The community drop-off containers which were spread around local community areas were also relatively successful in terms of mass of batteries collected. The lowest performing were the hospital and fire service trials (Although these served their purpose very well for specialist battery types like hearing aid and smoke alarm batteries). Retail drop off trials were the second most effective (by volume) method but one of the least well received and used by the public. Both the kerbside and postal trials received the highest awareness and community support. An EU directive on batteries that came into force in 2009 means producers must pay for the collection, treatment and recycling of batteries. This has yet to be ratified into UK law however, so there is currently no real incentive for producers to provide the necessary services. 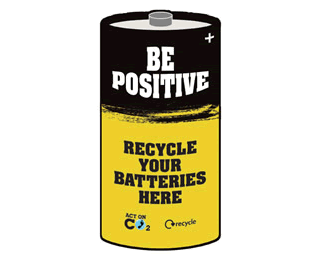 From 1 February 2010 batteries can be recycled anywhere the Be Positive sign appears. Shops and online retailers that sell more than 32 kilograms of batteries a year must offer facilities to recycle batteries. This is equivalent to one pack of four AA batteries a day. Shops which sell this amount must by law provide recycling facilities as of 1 February 2010. In Great Britain an increasing number of shops (Argos, Homebase, B&Q, Tesco and Sainsbury's) are providing battery return boxes and cylinders for their customers. The rechargeable battery industry has formed the Rechargeable Battery Recycling Corporation (RBRC), which operates a free battery recycling program called Call2Recycle throughout the United States and Canada. RBRC provides businesses with prepaid shipping containers for rechargeable batteries of all types while consumers can drop off batteries at numerous participating collection centers. It claims that no component of any recycled battery eventually reaches a landfill. In 2015, Energizer announced availability of disposable AA and AAA batteries made from recycled materials, branded as EcoAdvanced. Japan does not have a single national battery recycling law, so the advice given is to follow local and regional statutes and codes in disposing batteries. The Battery Association of Japan (BAJ) recommends that alkaline, zinc-carbon and lithium primary batteries can be disposed of as normal household waste. The BAJ's stance on button cell and secondary batteries is toward recycling and of increasing national standardisation of procedures for dealing with these types of batteries. In April 2004 the Japan Portable Rechargeable Battery Recycling Center (JBRC) was created to handle and promote battery recycling throughout Japan. They provide battery recycling containers to shops and other collection points. ^ Bernardes, A. M.; Espinosa, D. C. R.; Tenorio, J. A. S. (3 May 2004). "Recycling of batteries: a review of current processes and technologies". Journal of Power Sources 130 (1–2): 291–298. ISSN 0378-7753. doi:10.1016/j.jpowsour.2003.12.026. ^ a b "EU agrees battery recycling law". BBC Online. 2006-05-03. Retrieved 2010-10-22. ^ Department for Environment, Food and Rural affairs, 18 December 2009. Defra, UK - Environmental Protection - Recycling and waste. ^ Directgov, 22 January 2010. Recycling batteries: Directgov - Environment and greener living. ^ Info on recycling. WRAP - UK based Waste and Resources Action Programme. Retrieved 15th June 2011. G. Pistoia, J.-P. Wiaux and S.P. Wolsky, ed. (2001). Used battery collection and recycling. Industrial Chemistry Library, Volume 10. Amsterdam: Elsevier Science. ISBN 0-444-50562-8.